The short domestic flight from Kuala Lumpur, Malaysia’s biggest city, begins with a recital of Prophet Muhammad’s supplication before his travel. The passengers - most of them Muslims - cup their hands, as a crew member murmurs a short prayer over the loudspeaker just before take-off. Malaysia’s Rayani Air took to the skies with a clear bailiwick. 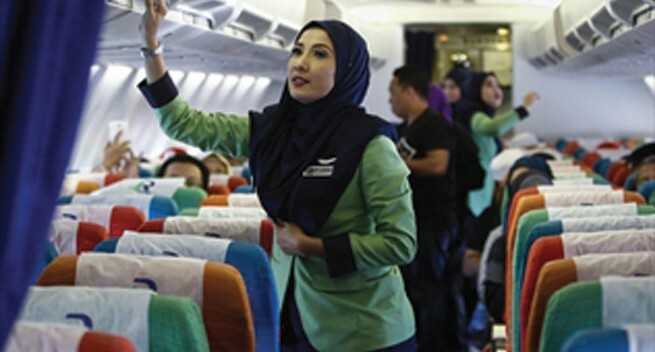 It is the country’s first Islamic airline, offering flights that adhere to Islamic rules, including prayers, no serving of alcohol or meals with pork, and a strict dress code for Muslim female flight attendants. The idea for Rayani Air grew out of much-publicised complaints by conservative Muslims who believed that two major air disasters for the national Malaysia Airlines - Flight 370 that went missing in March 2014 and Flight 17 downed a few months later over Ukraine - were caused by Allah’s wrath. Their solution: Airlines must adopt strict Islamic customs to avoid divine retribution. The reaction to the disasters, and the creation of the airline that operated its inaugural flight on Sunday, is an example of rising hard-line Islamic values in Malaysia.